You know that odd little t-shirt shop on the corner of Christopher Street and Greenwich Avenue? The one with all the pre-faded Blondie and Bowie shirts in the window? It appears to be gone. Unless they're just renovating, but it doesn't look like it. It was called Christopher's NYC and it had been there for some time. The reader who tipped me off says it was there for decades. Another said for 41 years. It was praised a few years ago on Racked: "This obscure and random T-shirt shop gives you the feeling you're walking into a tourist trap but once inside, you realize you've stumbled into something special." 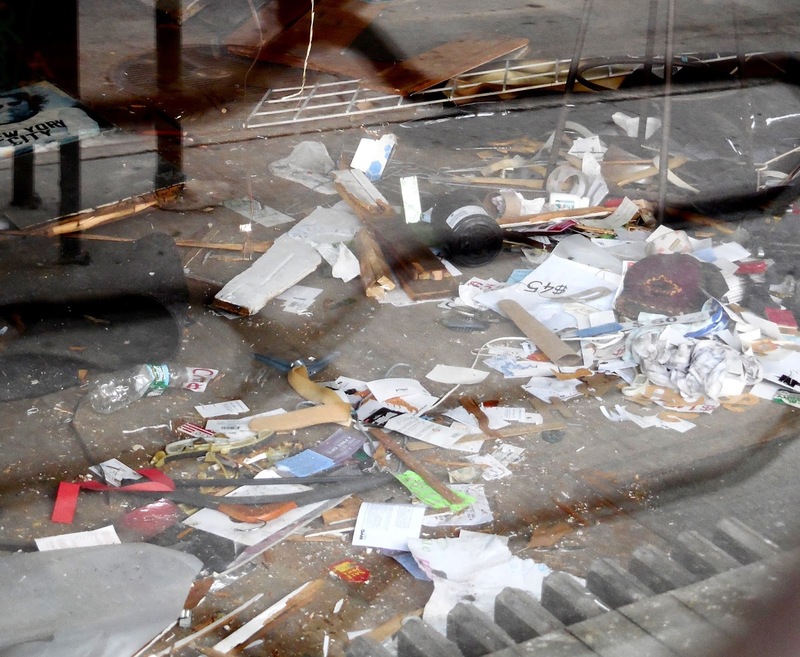 The inside of the shop today looks ransacked, the floor covered with papers, signs, junk. 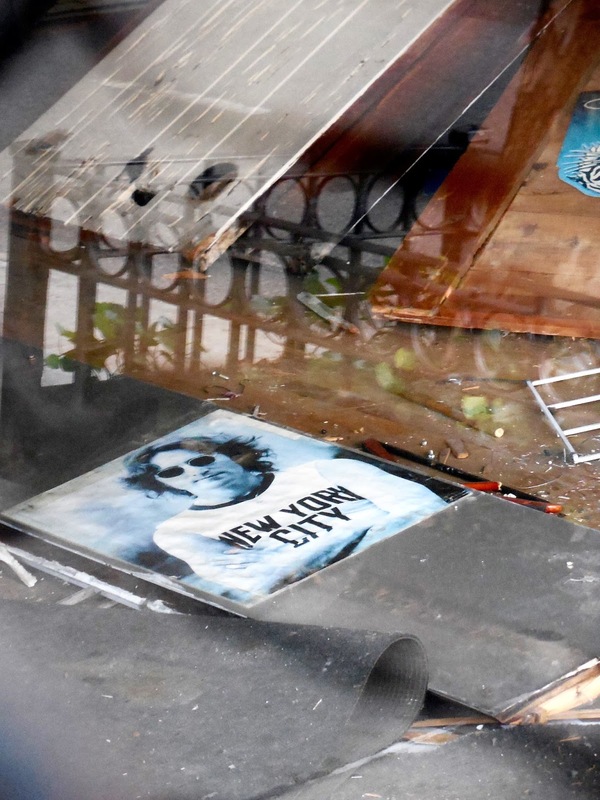 John Lennon wearing his New York City t-shirt. A suit jacket hangs from the ceiling. This block of Greenwich Avenue is vanishing fast. 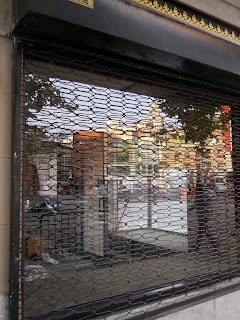 Many of the storefronts are sitting empty, including recently shuttered Grano Trattoria and the Firestore. I don't know why Christopher's closed, but I bet it will sit empty for awhile, adding to the high-rent blight of the area. You can still buy their t-shirts online. I take some small comfort in this, a form of schadenfreude, I guess, that the worthless rentiers are dooming their own investments with their never-ending greed. My beloved GV neighborhood (I lived on Bleecker Street and 7th Ave. for years) is unrecognizable to me and all the reasons that I loved living there have vanished. Thirteen years ago I was compelled to move to Florida for work and health reasons. I had always anticipated eagerly my return to NYC after my retirement in a couple more years. Now? I don't know that there would be a point to it. All the things I loved are gone, my favorite restaurants, my favorite shops, my favorite hangouts. What would living in the 'new' Nouveau Riche NYC offer me at this point in my life? I can't go to my favorite diners off Washington Square Park or 7th Avenue to enjoy a Sunday meal or a holiday anymore. I can't develop relationships with the sales clerks at national chain stores or high end retail destinations (nor would I want to, I think) like I had with all the fascinating little shops in the Village and around NYU, my alma mater. This hurts my heart and soul and makes me weep for that which is lost. Time marches forward and change comes like the sunrise but these changes are such a terrible loss and there seems to be no hope that it will become better. Again, this store was, to some of us, a "johnny-come-lately." In teh late 70s-mid 80's, it was a funky/weird clothing store that I patronized frequently. When it closed to make room for a generic t-shirt shop, I stopped visiting. As for the Village's "bohemian" reputation; I moved here in the late 70s, and even then, the was little sign of any kind of Bohemia. There was the Circle Rep theatre (already patronized by the suburban/wealthy crowd), and Charles Ludlam's Ridiculous Theatrical Company (the spotlight of attention from the mainstream press was beginning to kill even their bohemianism). There were some old-timer artists with rent-controlled apartments (no longer available to us fresh-off-the-bus types, without putting out for the lease holder and moving in), but 99% of Greenwich Village already belonged to NYU and the wealthy by that time (and probably had for many years). This is a punch to the gut, literally. I work around the corner. 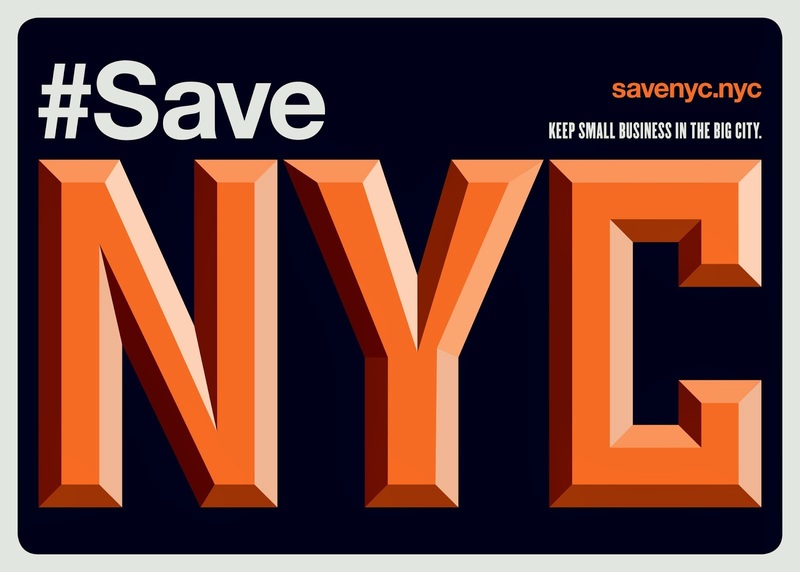 And, I have lived in NYC for fifteen years. This spot signified how great and unique NYC is, or now was. I frequented the spot many a time and recall wonderful memories in my twenties going past it, always thinking how there were no shops like this where I grew up out west in the desert. Shops of this nature belong in NYC. They should not be pushed out due to exorbitant rents. The sad truth perhaps is closures such as this are the new normal. Take a look around your neighborhood, absorb the surroundings, and make mental notes. Most of it, with the exception of commercial enterprises, will be gone. This is a sign of our financial and social climate. I found some of their merchandise really nasty (and I'm no prude). Ten or so years ago they had a shirt in the window that had some vile sexual reference that the kids from PS41 would comment on while waiting for the crosstown bus. I asked the owner very politely if he would move it out of the window and he rudely refused. Even then, GV was not solely a gay neighborhood, and there was no reason to ignore the fact that people with kids lived there as they always have and be hostile to a not-unreasonable request. And to the hater who always says, "What about the children?!"—STFU. 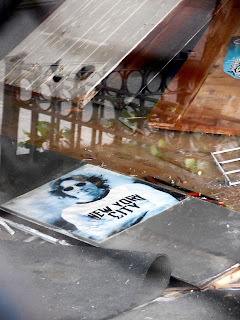 Let's have a modicum of perspective - it was an overpriced novelty T-shirt store, catering primarily to parent-subsidized NYU brats and tourists. There was nothing "genuine NYC" about it in the least. Scout, we can't all be 'pure' New Yorkers like you. Yes, it was a crappy t-shirt shop. Will you be happy when it is replaced by a Chase branch or yet another Duane Reed? I can miss whatever the hell I want to miss and it doesn't have to be a 'genuine' New York landmark. My best friend worked there and I have many fond memories of those days. Leave my memories alone! Brian Davis - all due respect, but no one told you what you're permitted to miss or not. Even were it in my power to do so, I wouldn't even think of infringing on your ability to miss a tourist and rich kid's t-shirt store; just as I would expect you to refrain from attacking my right to dismiss said store as trivial and of little worth to the city and community as a whole. And that's what they call an exchange of opinions! i lived on macdougal alley in the late 70s and earley 80s. i worked at balduccis and attended our lady of pompeii school then st francis xavier. carmine street was tight and all italian and still under the eye of the last of the old timers. i moved to texas in 83. i had been visiting nyc my entire life as my parents were from nj right outside the holland tunnel. i live in oregon now. ive come to terms with the changes as they happen everywhere. i quote Robert Frost "nothing gold can stay".